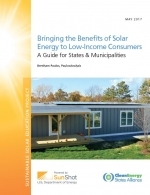 This 72-page paper reviews policies and programs to bring the benefits of solar power to low-income consumers. Germany and California look beyond the power sector to cut carbon, Energy Transition, November 28, 2017. US cities and states step forward on climate as Trump steps back, Energy Transition, November 22, 2017. How will Volkswagen’s Dieselgate settlement be spent?, Energy Transition, November 14, 2017. Solar Comes to the Trailer Park, Energy Transition, October 31, 2017. California Experts Weigh the Next Steps for a Western Regional Grid, Greentech Media, October 24, 2017. Hawaii Turns to Batteries for Grid Balancing, GE Transform, October 2, 2017. Annual Survey Report: Mastering the Utility Sales Cycle, GTM² (Greentech Media, subscriber only), September 20, 2017. Data visualizations using Tableau, for Wind Technologies Market Report 2016 and Utility Scale Solar 2016, from Berkeley Lab. Closed Circuit Reverse Osmosis System Squeezes Money Savings Out of Water Management, POWER Magazine, August 1, 2017. 6 Recommendations for Bringing Solar Power to Low-Income Households, Future Structure, July 18, 2017. Coal Generation Makes the US Power Grid Less Diverse, GTM² (Greentech Media, subscriber only), June 15, 2017. Bringing the Benefits of Solar Energy to Low-Income Consumers, for the Clean Energy States Alliance (CESA), May 2017. Should Investor-Owned Utilities Be Worried About Community Choice Aggregation?, POWER Magazine, May 2017. Drought Has Big Impact on California Power Market, POWER Magazine, April 26, 2017. Too Much of a Good Thing? An Illustrated Guide to Solar Curtailment on California’s Grid, Greentech Media, April 3, 2017. “Are We Understating the Potential for (and Uncertainty in) Wind Energy Cost Reductions? Berkeley Lab study shows greater potential than many other recent assessments,” ICER Chronicle, Issue 6, January 2017. With Ryan Wiser and Joachim Seel, Lawrence Berkeley Lab.